Ann Lazare headed eagerly across campus to Calculus 2, her very first class on her first day as a freshman in the University of Wisconsin-Platteville software-engineering program. But once she walked through the classroom door and took her seat, 15 minutes early, a rude awakening greeted her: She glanced at each of the other 30 classmates gradually trickle in—and realized that she was the only girl. 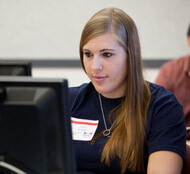 Ann Lazare at the annual programming competition in Ullrich. That class was no fluke. In every other class that followed, Lazare would find, at most, one other girl. “Growing up, you’ll hear about there not being enough women in the tech fields. But until you’re really in that situation and you experience it, you don’t realize how awkward you feel,” she says. But she made the best of it. In the second week, she introduced herself to everyone around her. Before she knew it, she had a circle of new friends, some of whom she’s still in contact with today. John Deere hired Lazare in August 2011, following her completion of an internship with the company that summer. It didn’t matter that she wasn’t actually due to graduate from Wisconsin-Platteville until May 2012: Her boss agreed to let her finish her senior year; the job would be waiting for her. “So I had the entire senior year with a job set up,” she says. Not everyone in software engineering finds his or her first job that soon. But it is common for software-engineering interns to get jobs at the companies where they intern, according to Lazare. “I’ve never heard of it not happening. Once you’re in a company through an internship, you’re pretty much golden, as long as you’ve done an acceptable job,” she says. The key is the level of work that the interns take up. Lazare delved into the same data programming and testing as the full-time employees—with the guidance of an assigned mentor who was always on hand to answer questions. “A good company will make the internship experience just as fulfilling as a full-time job,” she says. John Deere was doubtless impressed by Lazare’s classroom accomplishments, as well. For a senior-year project, she was one of 10 classmates who collaboratively created the PlattApp, a mobile-phone app that performs two services for students on campus: It shows the locations of computer labs and pinpoints which computers were available for use; and it connects the user to the dining hall to place a food order. Lazare and her classmates designed one version of PlattApp for DROID phones and another for iPhones. On either, a student activates the app and sees two icons—one for finding a computer, and one for food ordering. The app will be available on campus this coming fall, and could get further upgrades so that it can serve even more functions. “If future classes wanted to develop this further, they could integrate more functions into this PlattApp and continue to develop on this,” she says. Lazare calls the PlattApp her “second-favorite project” of her four years at Wisconsin-Platteville. Her favorite, which she completed for a “real-time embedded systems class,” was a group-project creation of an enhanced-accuracy breathalyzer. She and her group members received an alcohol sensor device and built components to display its readings. Then they figured out how to make sure that the readings were accurate. A human subject would first drink a beer and then blow onto the breathalyzer. Next, the team would account for factors that could throw the reading off. A higher room temperature, for instance, could spike the reading. So Lazare and cohorts formulated a mathematical equation, based on the thermostat, by which they would multiply the reading. They would also calculate the test subject’s proximity to the breathalyzer. If he or she blew too close to the piece, that, too, would raise the reading. “There was a little tweaking that took place,” she says. Lazare completed her degree with an emphasis on electrical engineering, a track that taught her how to program microprocessors, create and develop real-time embedded systems, and in general work simultaneously with hardware and software. With this skill set, she—like the rest of her fellow software-engineering graduates—is a contender for many jobs within many industries. The school was also a huge help in connecting students with work opportunities. Faculty would routinely receive e-mails from employers offering internships and co-ops. Every offer that the professors got, they forwarded to the students. Opportunities in software engineering are many and will remain so. Plenty more young people can find rewarding careers in this field like Lazare did—if, like her, they are willing to work and not be daunted by steep challenges. “Be prepared to work hard, but don’t let the anticipation of attempting the difficult programs overwhelm you and discourage you from giving it a try,” she says. 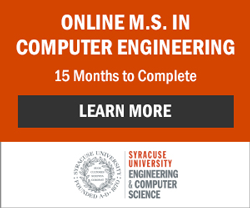 Learn more about the University of Wisconsin Platteville Software Engineering and Computer Science programs via an interview with Joe Clifton, Department Chair.